Swimmers can now return to bodies of water that were closed in the Bay Area for most of the summer due to toxic algae blooms. Noxious green blooms were first reported in popular swimming areas in spring, and park officials have been working since then to reduce the risk and reopen the lakes. Lake Cunningham in San Jose has been closed since January and has yet to reopen. Closures due to toxic blooms have become increasingly common in California and are a rising concern for park managers and public health officers. Local and state officials in charge of addressing the problem algae are finding their work cut out for them, both during the summer season as well as in the long-term. The prevalence of algae blooms in the Bay Area this summer jumped dramatically compared to last year. This year nine have been reported, last year it was six. Statewide, the number of blooms has almost doubled: 46 have been noticed so far this year, compared to only 23 last year. The most common way that authorities deal with this issue is to treat lakes with chemicals, in hopes of opening them as soon as possible. But some officials and communities are also experimenting with long-term solutions. Jackie McCloud, a water manager in Watsonville, believes a “slow culture shift” is needed to encourage communities to act on local water issues. 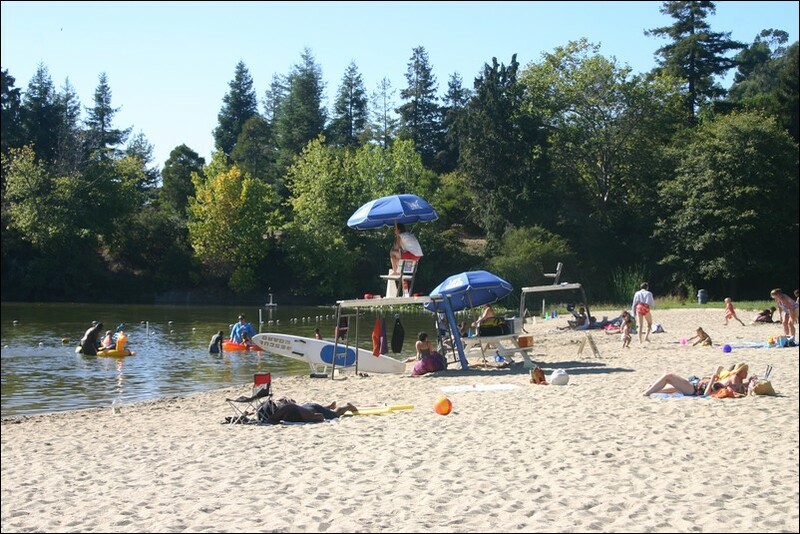 “It can look like a lot of different things,” says Hal McClean, water specialist for the East Bay Regional Parks District. The algae is primarily recognized by its bright green color and its apparent shapelessness. Phosphorus is the main nutrient that causes these blooms, and even though it’s common and naturally occurring, massive amounts enter landscapes and water due to human activities. It can enter the landscape as fertilizer for lawns, or in manure for farms, and embedded in the food we eat, which can end up in septic systems underground. Phosphorus on land then travels into the water by hitching a ride on pieces of soil that get dislodged and move downhill. In California, a majority of this runoff happens during the winter rains, where big storms move massive amounts of soil. According to Dunn, this year’s rainy winter could be responsible for the swift uptick in blooms this summer. 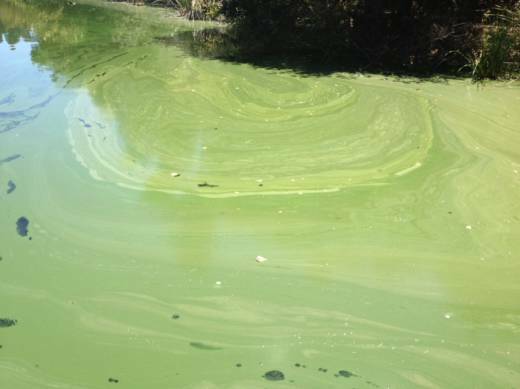 Solving the problem of algae blooms is difficult because once large volumes of phosphorus enter the water, it is practically impossible to get it out. Once blooms occur, park managers play whack-a-mole, killing blooms as them pop-up but rarely addressing the root of the problem. Blue-green algae is fairly common, though not all varieties produce toxins. A benign bloom can turn noxious at any point, and no one knows exactly why. To deal with this, McClean says he tests the waters twice a week –- minimum. The harmful strains of toxins can produce neuro- and liver toxins. If they touch the skin, they can cause rashes, lesions, or blisters. If swallowed, expect headaches, nausea and stomach pain. In California, there are yearly cases of animals dying from swallowing the water. Reports suggest that two dogs died soon after swallowing water in an algae-ridden pond in Napa County earlier this summer. The State Water Resources Control Board has a website that keeps track of blooms sighted in the state called the Harmful Algae Bloom Portal. The map allows the public to see the status of their local lakes and report blooms. Current ways of dealing with algae blooms fall into two categories: the easy way and the and hard way. The former involves adding things to the lake to try to either kill algae directly or trap nutrients and send them to the bottom. 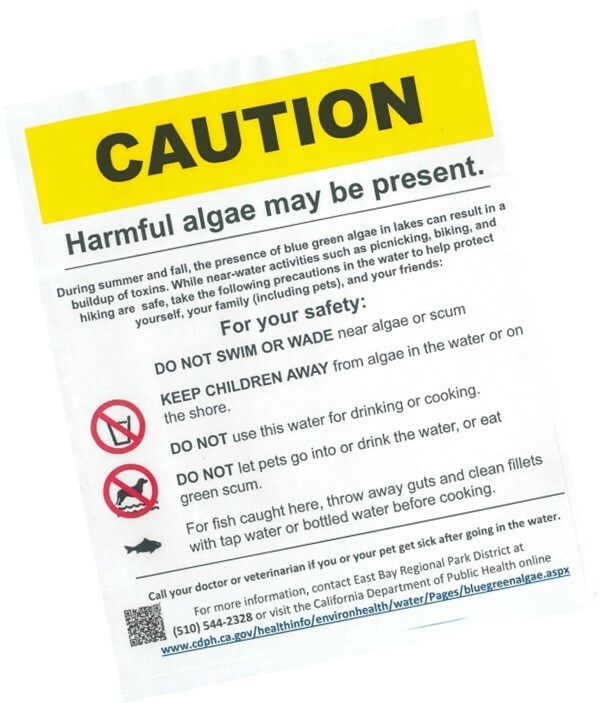 Algaecides (such as hydrogen peroxide or copper sulfate) are used to kill algae cells directly. These are considered “end-of-the-pipe solutions” — treatments that don’t get to the heart of the problem. 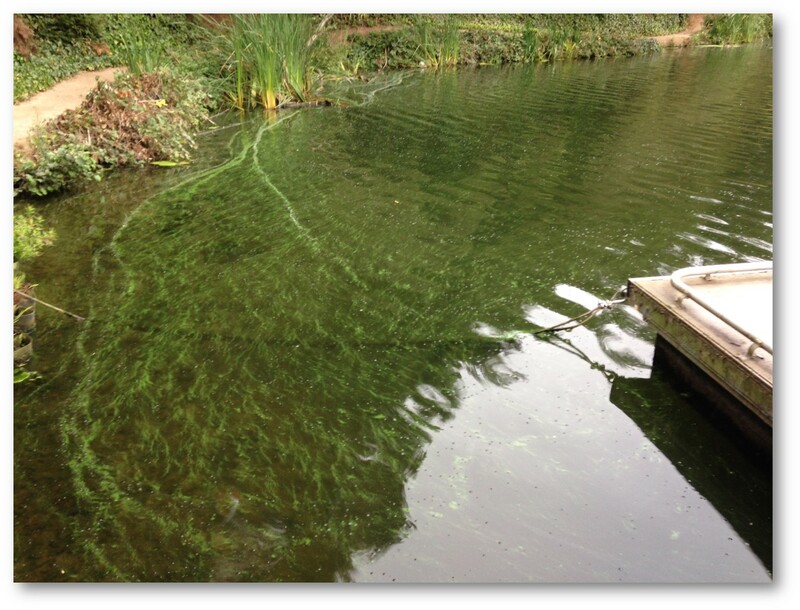 Nutrients continue to build up in the lake and it’s very difficult to get them out. “The vast majority of the mitigation strategies that are being used now are still in the ‘quick fix’ category,” says Dave Caron, aquatic microbiologist at the University of Southern California. Algaecides are applied as spot treatments to algae blooms in order to suppress them, but some bacterial strains inevitably remain alive in the water. This was the approach used by McClean on Lake Temescal and Quarry Lakes, which re-opened last week. However, even if things are looking good, noxious strains can come back within days or weeks. “If we’re testing the blue-green algae, and we’re not getting toxins, things could change tomorrow, or the next day,” says McClean. These short-term solutions are commonly used by managers throughout the state, but Caron and others believe they need to consider more holistic options. Removing excess nutrients from the waterways, and preventing them from re-entering, is the only long-term approach to prevent future blooms. The process, however, can be slow and expensive. Some communities have begun experimenting with removing excess phosphorus by providing places for plants and bacteria to grow. Once artificial islands--anchored on pallets or hay bales--have sucked up nutrients from the system, they can be removed, thereby cleaning the water. Granted, the most obvious solution is to keep phosphorus from getting into water bodies in the first place. This is tough, however, because nutrients come in from the surrounding landscape and not from a single point. It’s impossible to know exactly where they come from. It could be from farms, residential lawns, sewage treatment plants or stormwater. The diversity of sources of pollution means that a lasting solution requires bringing lots of different stakeholders to the table. This is what water managers in Watsonville are trying in their efforts to save Pinto Lake, which has been suffering from toxic algae blooms for decades. “Pinto is kind of a sick lake” said McCloud, a water quality specialist tasked with rehabilitating the health of Pinto. Their key approach is to inform and encourage community members to consider how their activities may contribute to the pollution. She estimates that around 20 percent of Pinto’s yearly phosphorus load comes from runoff of surrounding land. The rest comes from inside the lake, a product of years of buildup in the sediments -- highlighting the daunting task of remediation. 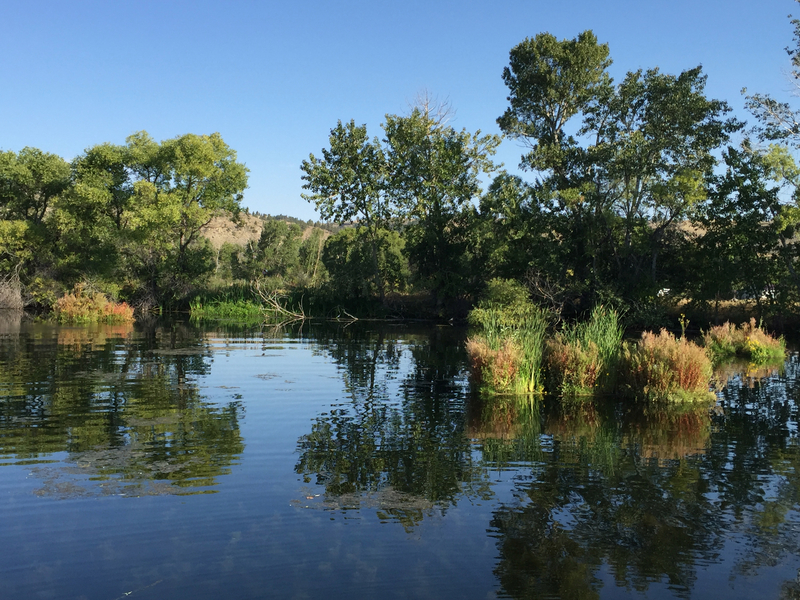 McCloud collaborates with the Resource Conservation District of Santa Cruz County to hold workshops, community meetings and public information campaigns. One recent workshop encouraged homeowners to use less fertilizer or get rid of lawns altogether, replacing them with native plants that don’t need water or fertilizer to thrive. They also hold farming workshops to promote techniques, such as cover cropping, that can protect soil and avoid erosion. Another target group has been septic system owners – who can learn how to inspect their systems and prevent leaching. 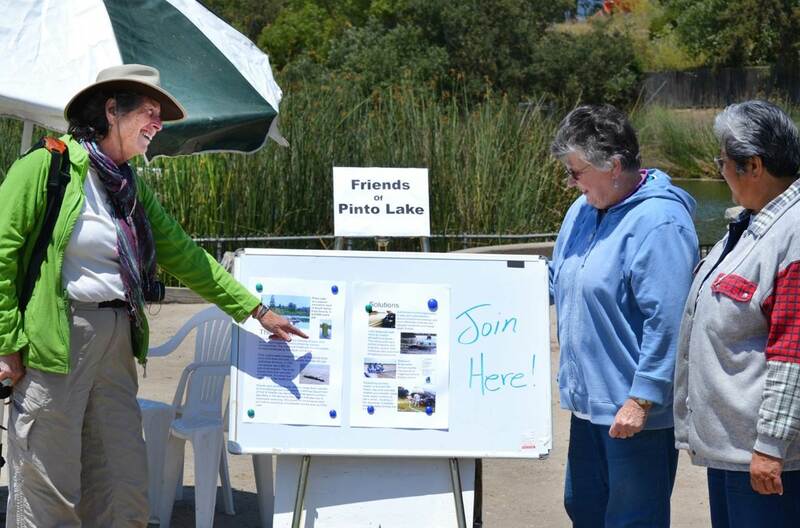 Around four years ago a group called “Friends of Pinto Lake” formed to create a shared vision of the lake’s future, based on the community’s desires, drawing from residents, indigenous groups and business owners.